Hike Download for PC – Are you looking for downloading and installing your favourite Hike messenger App on your PC? Then keep reading. We will provide you a step by step on how to Hike Download for PC and use it the same way you use Hike on your Android or iOS smartphones. Hike is one of popular messaging app in India with stunning user base. It is a good competitor to WhatsApp messages. In fact Hike provides you many more advanced features that are not yet introduced in WhatsApp. Hike is not just a messaging platform now. We will list down all the advanced features of Hike Messenger in this blog post. Hike is officially not available for PC or Laptop. There are only Android and iOS apps available at present. But you can still use and Download Hike for PC using few tricks that we are going to show you in this article. Hike is an fastest growing Indian app. Despite being experienced many ups and downs, it has steadily getting popularity and increasing its value. Launched in 2012, Hike currently has more than 100 million active user base and 90% of the hike users are under age 30. Over 1 billion messages are being shared on Hike every single day. As mentioned earlier, there is no official Hike App for PC version is available. You need to install any of the Android emulator to Download and Install Hike on your Laptop. Android emulator allows you to run any android application on your PC. There are many Android emulators available in the market. We will list down the best ones and will provide you the step by step guide to Download Hike for PC. Bluestacks is the no.1 android emulator by means of popularity. Millions of PC users are using Bluestacks to run their favourite Android Games and other apps on laptop. Now let’s see how we can use Hike for PC using the Bluestacks Android Emulator. Step 2: It takes few minutes to complete the installation procedure based on your internet connection. Upon the successful installation, Just open Bluestacks App player on your PC. 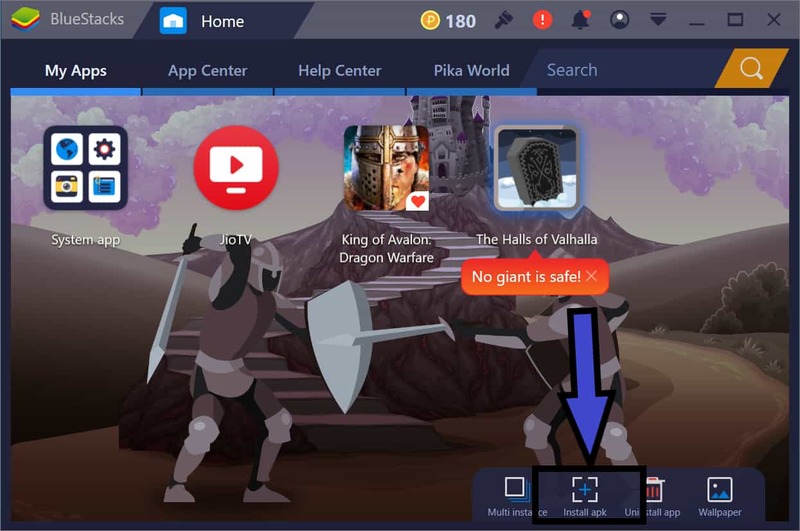 Step 3: On the home screen of Bluestacks you will find System Apps. Just tap on that and you will see Google Playstore app icon. Click on that to open Google Playstore. Step 4: Search for Hike Messenger in Google Playstore and Click on the install button – the same way you install android applications in smartphones. Step 5: Wait for some time to Download Hike for PC and install it on Bluestacks emulator. Step 6: Now go to My Apps section in the home screen and you will find Hike Messenger icon. Voila! Hike App is successfully installed on your PC. Now just click on that app icon and register with your mobile number. You can use the Hike app similar to how you use it on your smartphone. You can avail all the features and extensive stickers collection on PC as well. Bluestacks app is very user friendly and rich in graphics. It is very useful for playing high end games like PUBG for PC, Mini Militia for PC or Temple Run for PC. You need to have high end system with specified requirements to use Bluestacks app player. You may often encounter stuck while playing the game. MemuPlay is another excellent android emulator. Memuplay is exclusively designed for gaming purposes. But you can still use it for Downloading Hike for PC. Let’s start our step by step guide to Hike Download for PC using Memuplay. Step 2: Once it is installed, just launch it on your Laptop. Step 3: Now open Google Playstore in MemuPlay and search for Hike Messenger App. Find the official app developer and click on the Install button. Step 4: It takes few moments to download and install the Hike app on memuplay. Step 5: Once it is installed, you will find Hike app icon on the list of installed icons in Memuplay. Double click on the app icon to open Hike Messenger for PC. Memuplay is a simple interface emulator. You can use Hike app on MemuPlay with ease. Hike for PC Windows or Mac is not available yet. We will working on it bring it to you very soon. Just email us and we will let you know once it goes live! You can follow the similar steps mentioned above for Hike Download for Mac as well. Just Download and Install Bluestacks on your Mac book and then the remaining steps are pretty much straight forward. Simply navigate to Google Playstore and then install Hike for PC on your Mac Laptop. Hike has got very useful features that you wish every messaging app to have. Here are those good features that hike provides you. Hike allows you to hide your private chats. Using this feature you can hide chats from the main screen and access them with a password later. This is the most awaiting feature in WhatsApp which is not released yet. But you can do it with ease using Hike Messenger app. Even though official feature is not available to hide Chats in WhatsApp, using few tricks you can still achieve it. Here is the step by step guide on hiding whatsApp chats – How to Hide WhatsApp Chat? Make your conversations more fun and express your feeling with more ease using 20,000+ wide range of stickers hike has. It has huge collection of stickers in all Indian regional languages. There are dedicated team for each region to develop region level stickers. 3 billion stickers are sent over the Hike app at an average monthly. Disappointed with WhatsApp’s 250 members limit in group chat? then shift to Hike messenger app. You can create a group chat with up to 1000 members in hike and share the whatever you want with your community. Over the years hike has just evolved to more than messaging. It gives you personalised news feed as well. Get the news in over 9 languages and get to know about what is happening around the world on your finger tips. over 1.5 million hike users are subscribed to their English news feed. Cricket is a religion in India. You don’t need to shift to other apps like CricBuzz while you are in the middle of the chat to get the live cricket scores. Hike provides you fast cricket scores and news updates for you. Confused with something? Not able to decide what to choose? Create a poll on Hike and get the opinions or suggestions from your friends. The newly introduced magic selfie feature allows you to take beautiful selfies and it even provides you different editing options. It has very intensive filtered camera option. You can directly send the money to your friend through Hike Wallet option. Since its release, at an average 5 millions transactions are performed per month. It is the first app to integrate payments in India. Bored with the look and feel of the app? Change it to whatever the theme you love then. Hike app provides you an extensive customisation options to change the app theme, fonts and everything. The era of using cellular network calls to talk to your loved ones is rapidly declining. It is now replaced with call over the internet. Many apps like skype, Viber and Hike provides you both audio and video call features at free of cost. All your conversations in Hike app including audio and video calls are encrypted with 128 bit encryption. No one can see or hack your chat messages unless and until you hand over the phone to others with Hike app unlocked. Similar to WhatsApp, Hike messenger also provides you an option to hide your Last seen time. You can enable or disable this settings at any time. You can even set who can view your profile picture and status message. There are even more features you’ll get with Hike Download for PC. You will get all these features when you install Hike App on your PC as well. Hike is an all in one app that provides you an extensive toolkit of features than just messaging. You can customise anything with Hike app and make a beautiful conversation. Hike app is officially not available but you can Download Hike for PC using any of the above listed methods. So download hike app on your Laptop and have a great chatting experience. I’m concluding this article on Hike Download for PC with this. If you are facing any issues Downloading and installing Hike app on your laptop, do let us know using the comment box below. We will be glad to help you out. Cheers!